New Orleans Chaco Canyon is a national park, but the odds are you have never been there, and that you never will go there. It’s more than 30 miles off of a two-lane highway on a graded, dirt road in northwestern New Mexico. That’s on purpose. This isn’t Yellowstone. It’s not supposed to be easy. It’s more than 3 hours from Albuquerque in one direction, if you happen to be there. It’s more than 3 hours drive from Santa Fe, if you happen to be there. You have to want to go there, and in the case of Chaco Canyon, that’s actually a good thing. It’s a fragile, historical, heritage site, and to many – including me — it’s sacred ground. It’s dry, desolate ground ensconced in the Navajo Reservation. 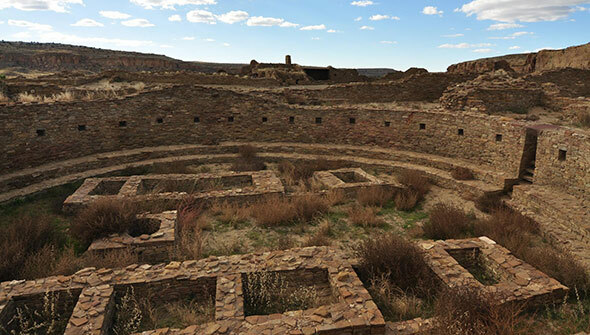 Almost a millennium ago, it was home to native peoples referred to as the Anasazi or old ones, the ancient people who first inhabited the area. The aridity of the area has remarkably preserved a number of religious kivas and dwelling structures in small villages that were bustling cities of sorts. I often describe Chaco Canyon as the home of the largest city in America in their time. Archaeologists continue to study the Chaco culture, its community, trade routes, and society seriously. Theories abound from the mundane to the extreme about the people. Several years ago there was an extensive argument about whether cannibalism was practiced. There is a continued mystery about what happened in Chaco Canyon. It thrived and then disappeared. Most believe there was an environmental collapse given the inability of the desert like climate to grow sufficiently to feed the thousands living there. Now there is a different environmental threat. The actual park is protected from resource extraction. Until recently the areas around park were also held off limits by the Bureau of Land Management (BLM). Now there is a proposal slowly gaining ground to lease tracts outside of the park to oil and gas companies. Environmental groups like the San Juan Citizens Alliance are fighting this effort as is a larger coalition Frack Off Greater Chaco that includes large local and national organizations as well as native people. These groups have filed suit to block the leases. There is an oil glut today with the price per barrel hardly over $50 endangering the business model and profits of many companies and countries around the world. The US is now an exporter of oil. Why endanger the Chaco Canyon area now for a few campaign contributions to a handful of politicians, when there is no substitute for the special, uniqueness of Chaco Canyon anywhere in the country and perhaps the world? Whether you ever go there or not, it’s important for you today and for generations to come to know tomorrow that such a place exists and is protected in perpetuity for what it was, but as importantly for what it is, and its ability to still transform the very spirit and souls of its visitors. This entry was posted in Ideas and Issues and tagged Chaco Canyon, environmental issues by Wade. Bookmark the permalink.